Having completed my 'Trilogy of the Sacred and Satanic"(the full-length documentary films Mysterion, Tanjuska and the 7 Devils, and Atman), I felt I had purged myself of what I had sought from the documentary film: its purifying and implacable concreteness. I had given whatever I had to give; to that concretion, an intimation of human silence. I felt an attraction and attachment to the logic of the dream, to which the fictional film provides the most natural path. The world of the dream is half in the past, half in the future. Its gods swing back and forth between life and death. There is no sense of longing in dreams. Time in dreams is not time in time. I directed the feature film "Fire-Eater". I have always been stimulated not only by the Sacred and Satanic, but also by the Poetic and Political. It was this that drew me back to the documentary. I don't care for truths, for I see all thought as roiling foam that adheres to nothing nor holds fast; but in the time when I am not asleep or dreaming, I wish to know how the human tribe leads its life, shapes its history and expresses its will, which always seeks to improve the human condition and yet wallows, bewildered, in its blood like some elk gone astray in the city and impaled on the spikes of a cemetery fence. It should not happen this way. Europe is filled with people who need grace of some kind to cope with their righteous rage. The righteous rage turns, a reflection, against them. And life is no court of justice; justice does not prevail, life does. It rises out of chaos in an ascending spiral, briefly appears to have structure, and descends in the curve of a downward spiral toward fresh chaos. Stripping away icons of the enemy calls for the acceptance of grace along with righteousness. Grace is illogical and irrational - in other words, a profoundly gratuitous liberation from the compulsion to hate. 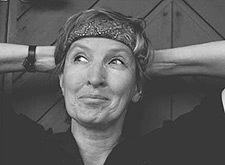 Pirjo Honkasalo has directed, written and worked as a cinematographer for documentaries and feature films for over 25 years. Ms. Honkasalo was born in Helsinki in 1947. She entered film school at the age of 17 and completed her cinematographic thesis at the age of 21. In the same year she shot her first full-length film. She continued to study and worked as an assistant at the Temple University in Philadelphia. Her first major directing role, the historical drama film Tulipää (Flame Top), was chosen for the Cannes Official Selection series in 1980. As a documentarian, she is best known for her trilogy The Trilogy of the Sacred and Satanic, the final part of which, Atman, won the Joris Ivens prize in Amsterdam in 1996.